On November 2 to 4, 2018, National Parks at Night hosted our very first Night Photography Summit. It was a remarkable success, and we are delighted. Thank you to all the eager photographers who attended. Most were from Long Island and New York City. But not all! We had attendees com all the way from California and even Belgium! We partnered with Rafael Pons, The Bard of PhotoPills. Rafael was on-hand during the entire event to coach people on how to use PhotoPills to plan for their shoots, and also how to use some of the incredibly versatile tools contained within that awesome little yellow app. Our lovely and generous sponsors were also on hand to support our passion for night photography education. BenQ brought their line of photographic displays, as well as knowledgeable imaging experts to talk about how seeing your images at their best on a BenQ display is a final step for serious photographers around the world. Bay Photo Lab sent an envelope full of gift certificates for free prints to give away at the end of each day. Rafael then stepped onto stage, connected his phone to the projector and proved that PhotoPills is not only the right choice for the night photographer, but that there is “a pill for every pain you have.” His presentation, “PhotoPills: A World of Possibilities on your Hand” had something for everyone. Then Chris and Matt took the stage to present, “10 Steps to Mastering Light Painting,” during which they walked the audience through, step by step, the successful ways you can apply light painting to tell your stories with photography at night. Rounding out Day 1 was an enthusiastic Q&A session with all four NPAN instructors and Rafael. We had to save some questions for the next day! On Day 2, after our inspiring stretches and chants, Gabe and Matt opened up Lightroom and showed a live demo, “After the Shutter Closes: Processing the Night.” Each spent a good amount of time working through RAW images to bring out the very best in them. Rafael once again showed us the magic on his phone with “Planning Star Trails and the Milky Way with PhotoPills” (below), which was full of fantastic questions (and answers)—not to mention a whole lot of people using their phones and tablets during the presentation to see that magic happen under their own fingertips. 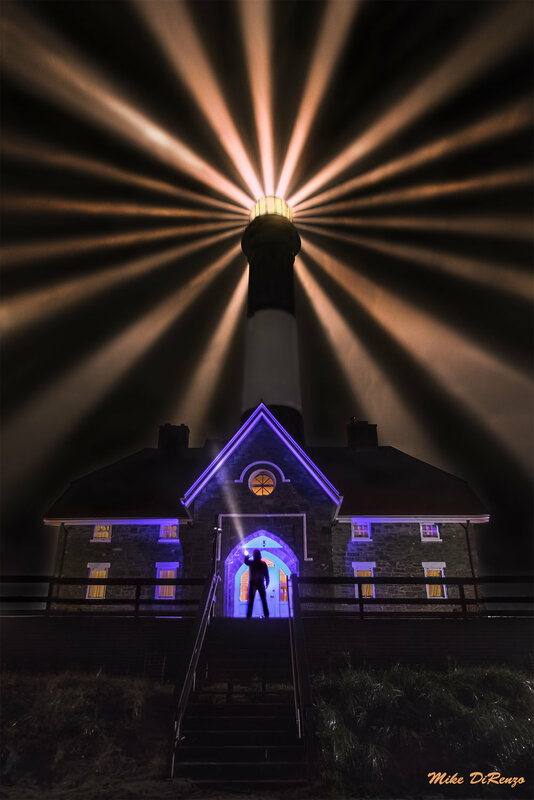 After lunch, Lance and Chris returned to present “Photographing Lighthouses, the Sentinels of the Seas” (below). 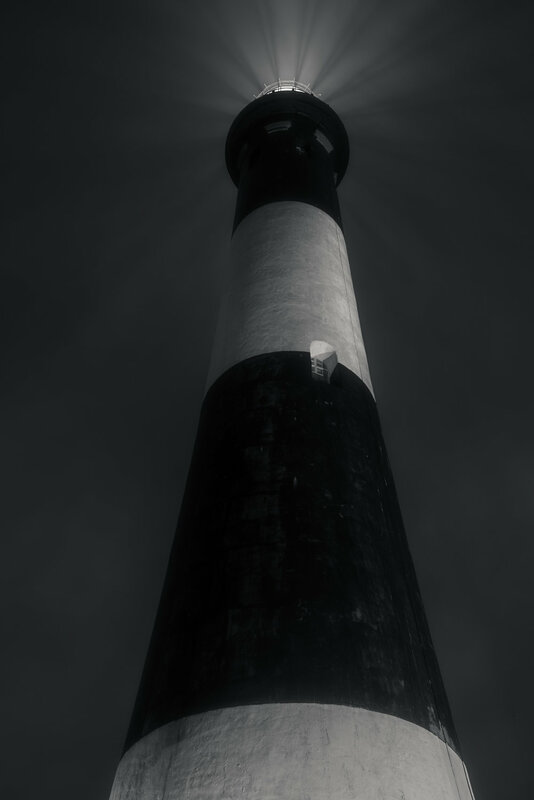 Truly germane to the work later that evening, they presented how to go about photographing lighthouses, including many techniques for planning and success. We had one more group Q&A to cover anything at all. And we did. Love that part. Excellent attendees. Our second and final night out started with a huddle at the base of the lighthouse. After a confab about the plan for the evening, we headed to the northern end of the beach to look south for a half-hour glimpse of the galactic core of the Milky Way creeping to the right of the lighthouse. 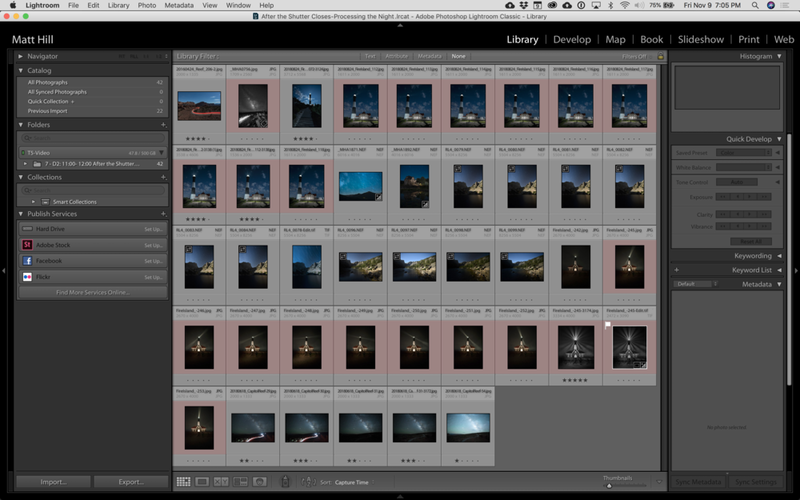 After this, we broke up into three groups and worked on Low-level Landscape Lighting (LLL), star stacking and long exposures. The night was clear, brisk and a little windy. But everyone walked away with images to be proud of! Lastly, we spent a few hours on image review. We dipped into Lightroom and gave feedback and instruction to attending students on images shot during the conference and at other times. Always a good way to wrap up, with clear ideas on how to grow and improve. With gladness in our hearts, and stars in our eyes, we called the Summit to a close. It was three days (and two nights) of sharing, learning and growing. We’re so delighted that you like what we do. Thank you for supporting us as we share what we love with you. Our success is your success. Note: Want to see us come to your area? We’re considering taking this show on the road. 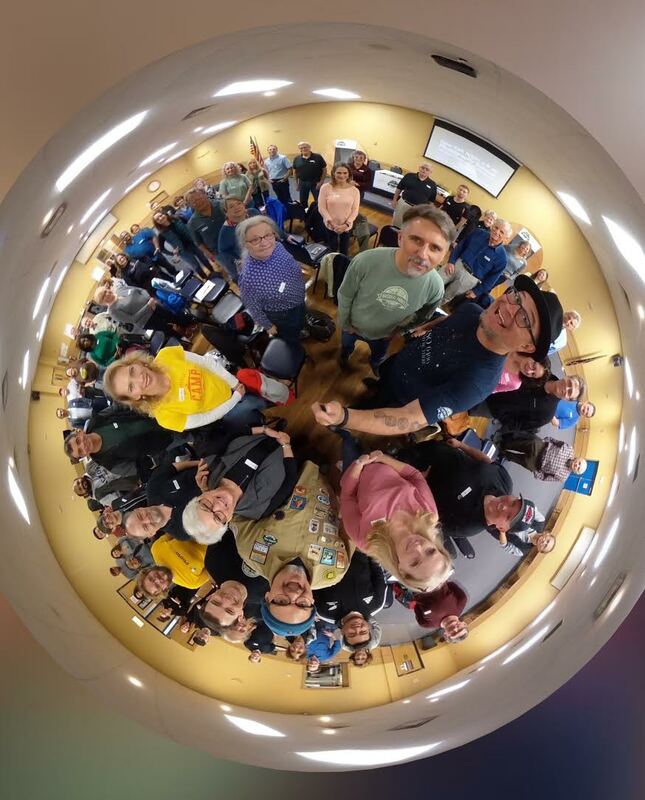 Do you run a regional camera club federation, or even a really strong, passionate group that wants to collaborate and host an experience like this near you? Drop us a line and let us know. Happy Anniversary Biscayne and Redwood national parks! We were so very thrilled and honored to be part of your 50th-year celebrations. We obviously love going to all the parks, but when we can work closely with the rangers and officials that help run these amazing places, it makes the experience even more worthwhile. In 2018 we formed a very strong relationship with both the aforementioned parks. We were so excited to take our students there for workshops earlier in the year as well as keep the communications building to create a cross-country “From the Redwood Forests to the Gulf Stream Waters” celebration. It was absolutely wonderful to see the friends we made this year, in addition to meeting more creative lovers of the parks during the festivities. A very big thank you goes out to Bay Photo Lab, which believed in our students’ work and printed a combined show of 42 night photographs, twice, so we that we could have the focal point of the celebrations be a gallery show at both parks. Our opening weekend at Biscayne had a ton of activities. We kicked things off Friday night, when 30 people joined us for a scenic boat ride to Boca Chita. We disembarked and had time to scout and explore the many vantage points on the island. At the end of civil twilight we gathered our group, plus two law enforcement park rangers joined us and were excited to see what we were creating. I had prepared a special “Birthday Wish” (below) on the Fotorgear Magilite, which is an LED light stick that you can program with an endless amount of colors, shapes and art and then “walk the image” into the scene. That is always a perfect example of how we can write anything with light. From there we broke into smaller groups and did night portraits and light painting—all in all, seizing the night! Saturday was a full day at the park. We were very excited to see our dear friend, National Park Patch Lady (below), who led a sunrise photo shoot, scavenger hunt and Biscayne quiz. Lots of fun Biscayne and national park stickers were finding their way to knowledgeable park goers. There was also a variety of ranger talks spearheaded by Ranger Gary Bremen. That kept most people busy until we kicked off the gallery opening and official party. We had live music (below) and over 100 people came to enjoy our images and share stories about Biscayne as we sipped wine and (of course) gobbled up birthday cake. We were also honored to have in attendance Lloyd Miller, who was instrumental in saving and creating Biscayne National Park half a century ago. That night we led another walk around Convoy Point (below) and the visitor center, and we were thrilled to be joined by a student from each of the Biscayne and Redwood workshops, in a truly wonderful weekend of celebration! 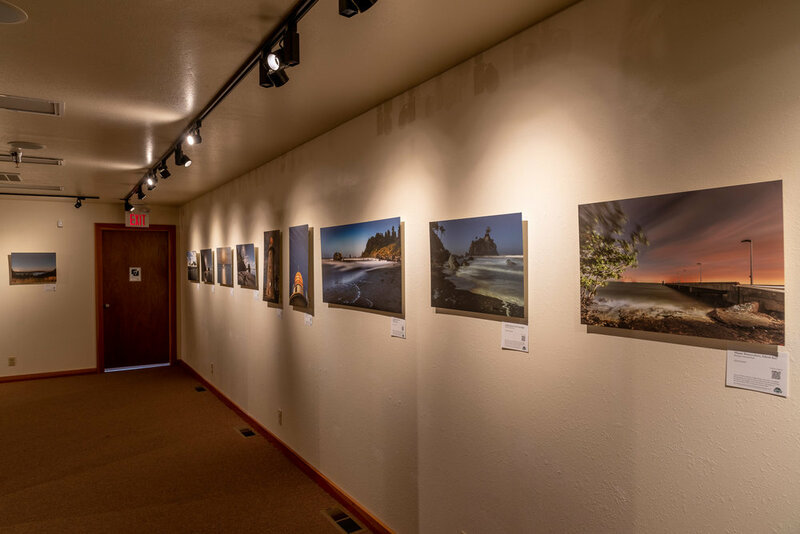 That very same weekend we made a return visit to Redwood National and State Parks to help celebrate their 50th anniversary with an exhibit of student and instructor photographs from our June workshop, which will be on display at the Hiouchi Visitor Center in the park until January 2019. The “From the Redwood Forests to the Gulf Stream Waters” exhibit opened on Friday, October 19, and was attended by the park staff, as well as members of the Save the Redwoods League, Redwood Parks Conservancy and the local community. About 50 people attended the opening during the course of the too-short evening. A highlight of the reception was ranger Michael Glore leading a singalong of Woodie Guthrie’s, “This Land is Your Land” (below), which alone was worth the trip to California. In addition to the exhibit reception, and a gallery talk led by Chris and I the following day, we also taught a one-night mini-workshop for the local community on Saturday, October 20. We had a small group of eager students and a great night in the redwoods at Jedediah State Park, photographing along the banks of the Smith River. We’d like to offer our thanks and congratulations to Michael, Chief Interpretive Ranger Candace Tinkler and Biscayne’s Ranger Gary for all of their hard work in putting together the events around the anniversary. It was a dream come true for National Parks at Night to collaborate with the parks in this way, and we hope to do more of these types of projects in the future. Bay Photo was more than just a sponsor—they made the events possible. The prints for both the Redwood exhibit and the concurrent one at Biscayne were made with Bay’s patented Xpozer system﻿, our new favorite way to display our work. All of the images from the exhibits are available for purchase at our online gallery, with all profits going to benefit both Redwood and Biscayne. Bay is a great partner to work with and they have stepped up in a big way to support both the parks and National Parks at Night. One final note is that under Candace’s leadership, Redwood National and State Parks is pursuing dark sky certification from the International Dark Sky Association, and plans to hold more dark sky events in the future. We look forward to seizing the night with them more in the years to come. Reminder: The exhibits are up in both parks until January 13; check visitors hours to see when you can view the prints. Or, you can support the parks by purchasing one of the prints at our online gallery. Talks & Walks: Visit us at two great NYC conferences this October! We're very excited to be a part of this conference that has been operating in Chicago for a few very successful years, and is now offering a weekend of spectacular educational opportunities in New York City. National Parks at Night will have a booth on the vendor floor, where you can come chat with us in-person about all the adventures we're planning for 2017 and beyond. It's also an opportunity to pick up any or all of the several books published by our team, on topics such as night photography, HDR and photographing the national parks. 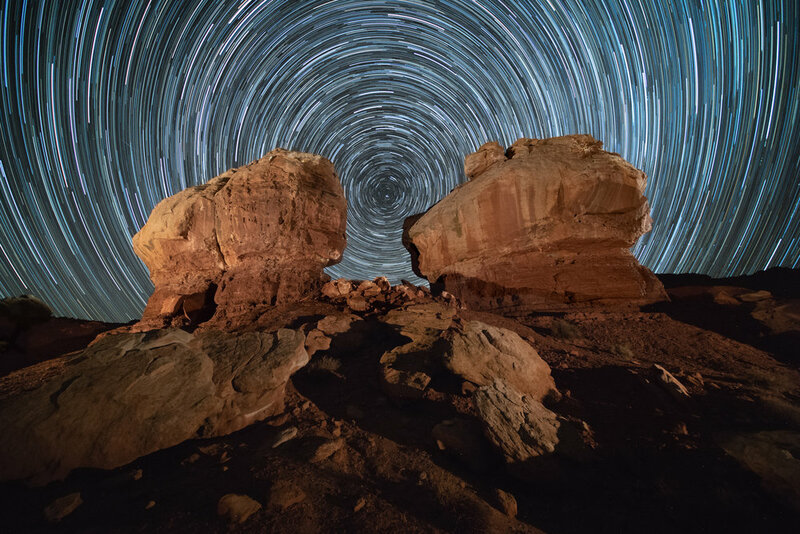 Additionally, our instructors Gabriel Biderman and Chris Nicholson will be presenting talks ("Night Photography: From Snapshots to Great Shots" and "Photographing National Parks," respectively) and offering two night-photography walks in New York City. When: Saturday October 22 from 10:15 a.m. to 12:15 p.m.
We are also very excited to be back at PhotoPlus, where we officially went public with the National Parks at Night program last year. (1st birthday! Yay!) Four of the five of us will be present and on stage for "Night Photography—Master the Night," a panel presentation about our favorite subject! Gabe, Chris, Lance Keimig and I will share a ton of tips on shooting under the stars in beautiful places. We'd love to see you there, at one of the industry's premier events!